The main failure mode in wet applications for vacuum motors is grease washout of the working end bearing. For years, the traditional designs would only yield 100 hours of life during the notable "suds" test, until AMETEK came out with the enhanced bearing seal. This innovation increased the life during the same test to 250 hours. Still, 250 hours was not acceptable for the commercial marketplace where downtime costs money. 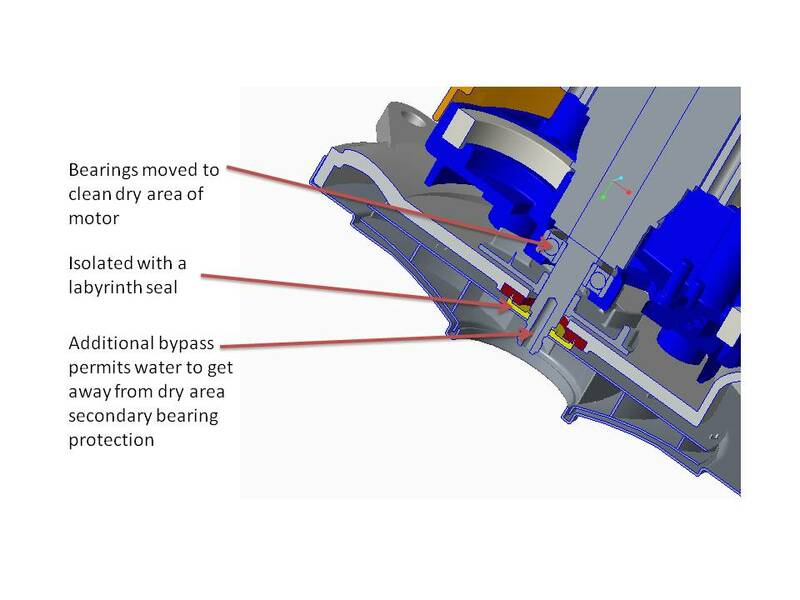 With AMETEK's new wet bearing protection, the vacuum motors no longer fail due to moisture washing away grease from the bearings. In fact, you can just about pump water through the fan system and the vacuum will not fail due to grease washout. The technology involved required a redesign and a bit of ingenuity. First, we moved t bearing away form the moisture by removing it from the fan system all together. Second, we installed a labyrinth seal to provide an impasse from the moisture in the fan to the bearing. Third, we moved the cooling fan from the traditional side of the motor down to its base. If water made its way past the labyrinth seal, it would be whisked away. Also, if you need even more protection, we drilled a hole through the shaft and then counter drilled next to the bearing. Finally, when the fan turns, the fan eye creates a negative pressure allowing water to be sucked out through the shaft and out of the fan system.